Hey guys, this is the first post that I’m writing or talking about negative things that are happening around. But unfortunately, it happens to be that the Number 2 site on the world wide web has made a big blunder in the history of social networking. Well I logged into Facebook, minding my own business and suddenly I notice that my chat window has been cut down into half and has been replaced by another box that looks like some sort of a live feed thing, Sort of like twitter feed timeline. Looking at the picture, you can see that there is no separate scroll bar for the chat window. That means, you can’t see who’s online and who’s not. Similarly you see folks who are offline and who are unavailable for chat making it pretty useless for Instant Messaging. 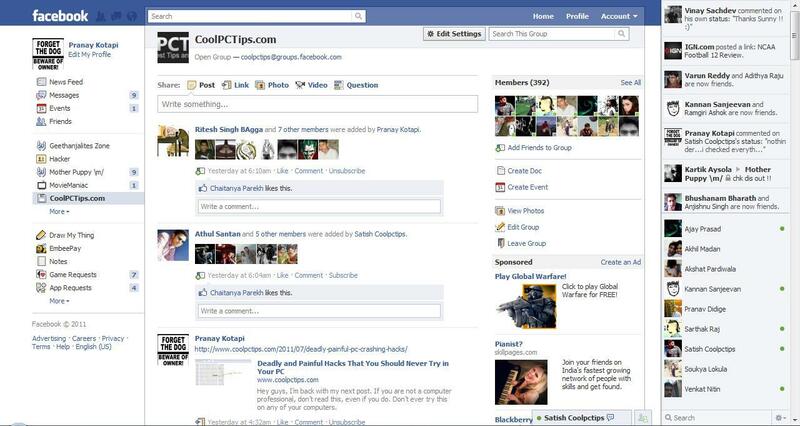 Good step taken by the Facebook folks to smash the plans of Google + and give them something to compete. But out of all those actions, it is we who are being irritated in between and being deprived of our social network experience. This Google +/Facebook fight for “Who’s gonna be the best Social Networking Site” is going way too much out of control. I think its about time that both of them should slow down and pace things up in a proper way so that its not the users who need to pay for the actions created by the Facebook folks. I’m not writing this post for pointing the blunders that Facebook made. I’m just concluding that Facebook, being the best website in the world, must think twice before doing something this stupid. Whatever it is, be it a bug or whatever, I just want my old Facebook chat. Here’s what my Facebook looks like. So unfortunate if yours looks similar ? 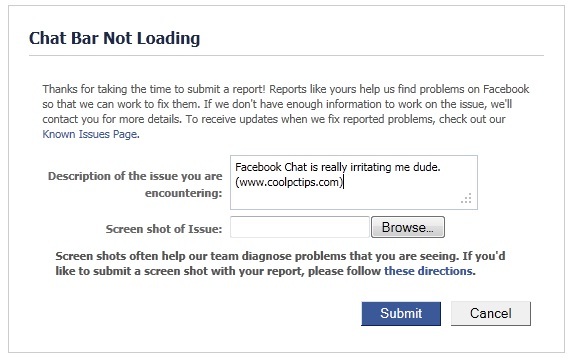 If so you can do one thing, you can send a report to facebook saying that you have some problems in accessing your Facebook Chat as usual as you use daily. All what you have to do is to click the link below and report your problem to them. I have reported my problem to them which is supposed to be resolved mostly in the upcoming 24hrs. Just enter the error in : Description of the issue you are encountering and also send a screenshot of the problem if possible. And if you are not able to get the access to normal chat in 2 days, You have to send again or wait for the bug to upgrade in next level. Try to send minimum 3 times the same message to Facebook in different timings. It may help you for sure. Hope you will find the chat to be normal again when you login your Facebook. Lets hope for the best. Please leave a comment below if you had faced the same experience. And also please get back to me if you have any queries. Pranay is studying computers in Information Technology Engineering at Geethanjali College Of Engineering And Technology.He is a full time professional Gamer besides studies and an active online gamer since 1999. Yeah man its really irritating..hope facebook changes it & corrects its debug..